This supplement is a companion to the CSL 1.0.1 Specification. It is aimed at style authors, and documents differences between official CSL and the CSL-m schema recognised by Multilingual Zotero. Modifications alter the behaviour or validation rules of existing CSL elements or attributes. Changes of this kind can cause official CSL repository to fail validation under the CSL-m schema: such styles will run, but may produce unexpected results. The potential effects of this category of changes are indicated where relevant. Extensions add entirely new elements or attributes to the schema. Styles making use of extended syntax will fail validation under the official CSL schema, and can be used only with Multilingual Zotero. Use the classic type for sources commonly cited within a field. Cites of this type do not appear in the bibliography, and can be completely reformatted to a compact, style-specific form using the Classic abbreviation list in the Abbreviation Filter. When a short form is supplied for a Classic item, the title variable is suppressed, and the short form entirely replaces the author variable. When a volume number or other details are included, these can be rendered on either side of the composite abbreviated form, but not of course within it. Use the gazette type for instruments published through an official gazette. Typical use cases would be cites to amending acts, to the initial version of legislation, or to orders and other instruments that are not available from other official sources. For consolidated acts or codified statutes or regulations, use the legislation (MLZ Statute) or regulation (MLZ Regulation) types instead. The format of gazette citations may vary among jurisdictions. Test the jurisdiction variable (see below) to discriminate between citation forms. The hearing type is primarily intended for transcripts of official hearings by government committees and the like (other documents produced by a committee should be cast as the report type instead). The body conducting a hearing is set in the authority variable (Legis. Body in MLZ). Use the regulation type for administrative orders at all levels of government. The video type is appropriate for video works that are not disseminated through an access-restricted distribution channel. For example, content hosted on YouTube should be set to video, while a DVD release of “The Wizard of Oz” should be set to motion_picture. Use cs:alternative to add supplementary reference information to a cited item, such as a translation or reprint. Elements within the scope of cs:alternative are rendered only when the value of language contains two valid ISO language codes joined by < or > (to indicate the direction of translation). The two language codes may be identical. In a multi-layout style, elements within the scope of cs:alternative are rendered in the primary locale associated with the target language code. Thus, if the input item has a language value of en>zh, and a multi-layout style has a layout with locale="ja zh", elements within the scope of cs:alternative will be rendered in the Japanese locale, with Japanese term definitions. Use the cs:alternative-text element to rerun the layout applied to cs:alternative with alternative item content. Variables for rendering via cs:alternative-text are set with an alt- prefix. Condition statements in official CSL take a single “match” attribute, which determines how the tests will be combined. The match attribute value (all, any, none) applies to all tests within the statement: grouping of tests with separate match values is not possible. To simplify the coding of complex styles, CSL-m introduces an optional alternative syntax for condition statements. The alternative syntax may be applied to cs:if or cs:else-if elements (the “parent node” in this description). The parent node must have no attributes, and a single cs:conditions node as its first child element. The cs:conditions node must have one or more cs:condition children. The cs:condition children each define a conditional statement with attributes specified in the CSL 1.0.1 schema and in this Supplement. The cs:condition statements are joined according to a mandatory “match” attribute on cs:conditions. Note that CSL-m adds a “nand” match value (true if at least one of the tests or condition statements to which it applies returns false), in addition to “all”, “any”, and “none”. Institutional names are fundamentally different in structure from personal names. CSL provides quite robust support for the presentation and sorting of personal names, but in CSL 1.0.1, institutional names have just one fixed form, and are otherwise treated the same as personal names in a list of creators. Examples 3 and 4 render both the full form and the acronym of a single institution name, with arbitrary ordering of the two name parts. Example 1 begins with the smallest subunit in a list of related institutions, and example 2 does the opposite. Examples 1 and 2 are pure organizations, while example 5 is a mix of personal and institutional names. Examples 1, 2, 3 and 4 would be entered as literal strings currently, which has obvious drawbacks. Example 5 would require that the authorship information be spread across two variables, although all parties listed are equally authors of the resource. Example 6 can be produced in CSL 0.8, but examples 7 and 8 cannot. The MLZ extensions to CSL 1.0.1 provide a cs:institution element, which can be used to produce any of the above forms, without interfering with the formatting of ordinary personal names. The extension is always enabled in citeproc-js, but the application calling citeproc-js (i.e. Zotero) must specially flag institutional names for it to take effect. MLZ provides this flag, while the official Zotero client does not. For this reason, this extension only works with the multilingual client at present. In multilingual Zotero, names entered in two-field mode are personal, and those entered in single-field mode are treated as organizations. Names should be entered in the order in which they should appear in citations, with one (extremely rare) exception: when an unaffiliated author is included in a list of names that includes one or more institutions, the name of the unaffiliated author(s) should come after that of the last institution in the list. Subunits of an organizational name should be separated with a field separator character |. Single or multiple personal Names that are co-authors with an organization would be entered above the relevant organization name. In a very simple style, the sample above might be rendered as: Clarke, Ministry of Fear and Smith & Brown, Large Corporation. 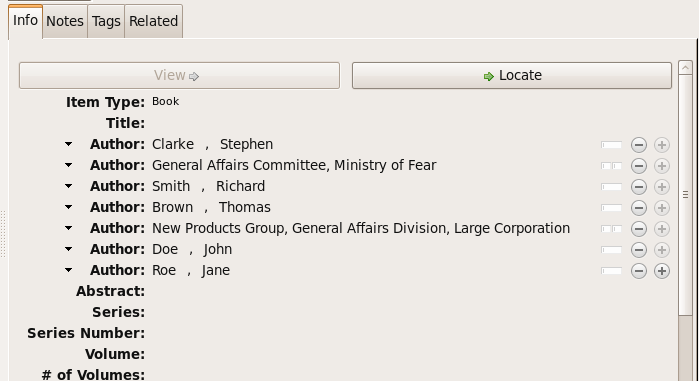 In a very simple style, the sample above might be rendered as: Doe & Roe with Clarke, Ministry of Fear and Smith & Brown, Large Corporation (note the reverse ordering in this case, with the names at the end placed at the front of the rendered list of names). The structure of mixed personal and organizational names can thus be expressed in the current Zotero UI. We now turn to the extended CSL syntax used to control the appearance of such names. A cs:institution element can be placed immediately after the cs:name element to control the formatting of organization names. between affiliated authors and their institution. The and attribute on cs:institution, if any, is used for the final join between two or more author/organization units. With this CSL, all of the delimiters in the following string would be drawn from attributes on cs:institution: R. Smith, Small Committee, Large Corporation, G. Brown, Busy Group, Active Laboratory, and S. Noakes, Powerful Ministry. To control the omission of names from the middle of the list of organizational subunits, either of use-first or substitute-use-first may be used to pick names from the front of the list. The use-last attribute picks names from the end. The substitute-use-first attribute includes the leading (smallest) subunit if and only if no personal names are associated with the organization. The components of organization names are normally rendered in their long form only. When the Zotero Abbreviations Gadget is used with Zotero, abbreviated forms for these names may be available to the processor. To use the short form, or combinations of the long and short form, an institution-parts attribute is available on cs:institution. The attribute accepts values of long, short, short-long and long-short. This attribute would be used to produce examples 3 and 4 in the list of samples, with values of short-long and long-short respectively. A value of short behaves in the same way as form="short" in other contexts in CSL, using the short form if it is available, and falling back to the long form otherwise. One or more cs:institution-part elements can be used to control the formatting of long and short forms of organization names. Like cs:name-part, these elements are unordered, and affect only the formatting of the target name element, specified (as on cs:name-part) with a required name attribute. D. H. McQueen, “Patents and Swedish University Spin-off Companies: Patent Ownership and Economic Health”, Patent World, March 1996, pp.22–27. In the example above, an item with en, es or de (or de-AT) set in the language variable will be render by the layout-citation-roman macro, with locale terms set to the appropriate language. In CSL-m, authority is handled as an institutional creator, not as an ordinary variable. It is rendered with a cs:names element. The use of suppress-min="0" in this example is documented below under suppress-min (extension). The CSL-m available-date variable is appropriate for the date on which a treaty was made available for signing. The dummy name variable is always empty. Use it to force all name variables called through a cs:names node to render through cs:substitute, and so suppress whichever is chosen for rendering to be suppressed through the remainder of the current cite. The hereinafter variable is a backreference form specific to a particular item and style. In MLZ, it can be set only through the Abbreviation Filter. The role of the variable in a given cite (i.e. whether it provides an alternative title, an acronym or a more complete formatted citation) depends on the the style and context. The Abbreviation Filter will offer an entry in the hereinafter list for every item cited in the document. It is not necessary to use form="short" on the cs:text node that renders the variable. In CSL-m, locator is a numeric variable. Validation requires that it be rendered with cs:number. The locator variable will render exactly once in a citation; subsequent attempts will render nothing. As with variables suppressed via cs:substitute, the test for variable="locator" will continue to return true after the variable is suppressed from further output. In this example, “123” is the value of the locator variable (a page or other pinpoint string), the | character marks the end of the pinpoint, and the ten-character string immediately following is a full date. If supplied, dates must be given as shown above, zero-padded, in year-month-day order, and with no space between the date and the | character. Non-conforming strings following the | marker will be treated as a locator-extra variable. The locator-extra variable consists of a string that is not a date, following the locator-date string (if any) as described above. If supplied without a locator-date, the locator-extra string must be preceded by a | field separator character. This variable can be used for version descriptions associated with some looseleaf services. These extensions are useful with looseleaf services, because the dates of the content in these services varies depending on the page cited and the time at which the resource was referenced. These extensions permit a single item in the calling application’s database to represent the volume on the library shelf, the page date being optionally supplied by the user when citing into a document. The page and page-first variables are numeric in CSL-m. The validator requires that they be rendered with cs:number. CSL-m adds a publication-date variable to the language schema. It is available on the gazette, legal_case, legislation, patent and regulation types, and provides the date on which the instrument was published in the given reporter. On the patent type, it represents the date on which the patent was published for opposition (applicable only in certain jurisdictions). The publication-number variable is available on the patent type, and provides the number assigned to a patent published for opposition. It is a numeric variable, and validation requires that it be rendered with cs:number. The supplement variable and its associated locale term are useful for secondary sources that are regularly updated between fresh editions. Such fine-grained updates are found in secondary legal publications. Although a supplement may be identified by number or by name, supplement is a numeric variable, and validation requires that it be rendered with cs:number. The volume-title variable is available on items of the book and chapter type. Use it to identify the name of a volume within a larger work known by an umbrella title (which may in turn be a part of a publisher’s series, described by collection-title). While any variable can be set with an alt- prefix for rendering in cs:alternative-text, a few variables are recognized as first-class variable names that can be referenced directly in the style, for testing purposes. If the content of the name variables match exactly, the matching content will be rendered once, using the matching term as label. This is in accordance with the standard CSL Specification. Otherwise, the variables will not be rendered, and processing will proceed to cs:substitute, and the two variables called on cs:names remain available for rendering. This can be useful where and editor and a translator, for example, should be rendered as a unit if they refer to the same person, but in separate parts of the citation if they differ. The exclude-types option is available on the cs:bibliography element. Use it to specify a list of item types that are to be excluded from the bibliography. The exclude-with-fields option is available on the cs:bibliography element. Use it to specify a list of fields to be excluded from the bibliography if they contain a value. Use the default-locale-sort attribute on the cs:style node to specify the language collation to govern sorting behaviour. The sort locale has no effect on the language of standard terms and labels. If this attribute is not set, the sort locale is aligned with the default locale of the style or processor instance. CSL-m allows conversion of ordinary Gregorian dates to the Japanese form often used in legal citations and other government records. The conversion is only valid for dates after 1873. Prior dates on the traditional lunar calendar are not supported, and should be written as literal strings in the input. In CSL 1.0.1, rendering the title variable with the attribute form="short" produces the same result with any item type: if the title-short variable has a value, that it used; otherwise the title variable is rendered as a fallback. In CSL-m, on the legal_case type only, the form="short" attribute does not attempt to render title-short, but instead renders the title variable, transformed by the Abbreviation Filter if an entry for it exists in the list there. This permits the application of style-specific abbreviation rules, as required by law-specific style guides such as The Bluebook: A Uniform System of Citation. Renders when the cite is not one of a series of parallel cites. Renders when the cite is one of several cites in a parallel series. Renders when the cite is one of several in a parallel series, and is the first cite in the series. Renders when the cite is one of several in a parallel series, and is not the first in the series. The label-form attribute can be used on cs:number and on cs:text with the macro attribute. It accepts the same arguments as the form attribute for localised terms: long, verb, short, verb-short and symbol. Its effect is to override the form attribute applicable to terms called via the parent cs:text or cs:number node. This can be useful where macros are copied across styles that require different label forms. When set on a cs:style-options node in a locale file or in a style, the leading-noise-words attribute takes a comma-delimited list of words as its argument. When a list is set, the same attribute on a cs:text node with variable="title" takes an argument of demote or drop. With the demote attribute, noise words at the start of the field are rendered after the remainder of the title field, delimited by a comma. With the drop attribute the leading noise words are simply removed. With the nand argument to the match attribute, a node test is true if at least one of the tests it invokes is false. This is the counterpart of name-as-sort-order, available on cs:style-options only. Its operation is identical to its counterpart, but has the opposite effect of forcing reverse-order rendering of all names bearing the specified language tags. The name-as-sort-order attribute is described immediately below. A name-as-sort-order attribute is available on the cs:style-options locale element, taking a list of space-delimited country codes as its argument. Country codes in the argument should be limited to a single element (i.e. the language only, without a country or other specifier): other elements will be ignored. When the first element of the field language (either explictly set, or defaulting to the item language field value, if any) matches one of the specified locales, the name is forced to “sort order”, regardless of its character set. The example above will force names tagged as Korean, Japanese, and Chinese to sort order (i.e. family name first). This attribute does not interfere with short-form rendering or abbreviation (see the next heading below for that setting). The name-never-short attribute on the cs:style-options locale element takes a list of space-delimited country codes as its argument. Country codes in the argument should be limited to a single element (i.e. the language only, without a country or other specifier): other elements will be ignored. When the first element of the field language (either explictly set, or defaulting to the item language field value, if any) matches one of the specified locales, the effect of form="short" is suppressed when rendering the name concerned. The example above suppresses form="short" on names tagged as Hungarian, Korean, Japanese, Myanmar, Vietnamese, or Chinese. This attribute is deprecated. Use is-parallel instead. Ordinary affixes in CSL-m are subject to a restriction: a prefix attribute may not begin with a space, and a suffix attribute may not end with a space. Affixes on cs:label within a cs:names element, and affixes within the scope of a cs:date element are not subject to this constraint. The purpose of this requirement is to assure that styles are incapable of rendering cites with stray punctuation or multiple spaces. Where spaces are required between elements, they should be applied using a delimiter attribute value on a cs:group element. The processor carries a list of prepositions and other terms that will not be capitalised when rendering a field with text-case="title". Within a locale, the skip-words attribute on cs:style-options can be used to replace this list of terms with another. The attribute value should be a comma-delimited list of words or phrases. The subgroup-delimiter attribute is a field-parsing hack coded into the citeproc-js processor, enabled when the processor is run in CSL-m mode. In a group containing only cs:text elements rendering the publisher and publisher-place variables, the processor will split the content of both fields on a semicolon. If the length of the resulting list objects is equal, each publisher/publisher-place pair will be joined with the delimiter string set on the enclosing cs:group element. The composed pairs are then joined using the subgroup-delimiter value. The subgroup-delimiter-precedes-last attribute controls the use of the delimiter between the last and the penultimate pair in the same manner as delimiter-precedes-last on a cs:name element. The and attribute with an argument of text or symbol may be used on the cs:group element to join the final item with the specified term. <group delimiter=" " subgroup-delimiter=", "
In the MLZ extended schema, names can be suppressed in two ways. First, using suppress-min and suppress-max with values of 1 or above, names rendered via a cs:name element can be suppressed entirely when the number of individual names is at or below a minimum, or at or above a maximum. Second, with a value of 0, suppress-min can be used on a cs:name or cs:institution element to suppress only names of that type. See the description of suppress-min below for an example of how that works and why it might sometimes be useful. Title of the Article / A.I. Stamou et al. If a personal author is given along with the institutional author, the author [sic] should be included in a parenthetical at the end of the citation. U.N. Econ. & Soc. Council [ECOSOC], Sub-Comm. on Prevention of Discrimination & Prot. of Minorities, Working Group on Minorities, Working Paper: Universal and Regional Mechanisms for Minority Protection, ¶ 17, U.N. Doc. E/CN.4/Sub.2/AC.5/1999/WP.6 (May 5, 1999) (prepared by Vladimir Kartashkin). CSL-m adds a normal argument to the possible values of text-case. This is mainly useful when rendering a cs:number element in the scope of an element that applies a text-case transform, to prevent text content in the rendered variable from being affected by the transform. CSL-m offers a year-range-format attribute on cs:style, as a complement to page-range-format. It takes the same arguments: expanded, minimal, minimal-two, and chicago. When used, this attribute specifies a collapsing format for year ranges separate from that applied to page ranges. The context test attribute takes exactly one of the arguments bibliography, citation, or alternative. It does exactly what its name and value suggest, returning true when the condition is executed in the relevant context. This test is useful where complex logic is needed to compose a particular element, which changes only slightly depending on context. The genre test attribute takes one of five arguments: email, instant-message, podcast, radio-broadcast, or television-broadcast. These correspond to strings automatically inserted into the genre variable by MLZ (where no value is set manually by the user) on the Email, Instant Message, Podcast, Radio Broadcast and Television Broadcast types respectively. This is obviously a hack, and mimicks the effect of having five separate types for these items in CSL, as opposed to two (i.e. personal_communication and broadcast). The has-day condition attribute tests whether the date variable given as argument has a value that includes a day. The has-to-month-or-season condition attribute tests whether the date variable given as argument has a month or season (and no day). The has-year-only condition attribute test whether the date variable given as argument has only a year (and no day, month or season). When citing primary legal resources, the form of citation is often fixed, for ease of reference, by the issuing jurisdiction— “jurisdiction” referring in this case to international rule-making bodies as well as national governments. CSL 1.0.1 provides a jurisdiction variable, but it cannot be used because Zotero does not currently have a corresponding field. The particular requirement for this variable is that it be tested in a cs:if and cs:else-if condition, so that citations can be varied according to the issuing jurisdiction. Testing of field content is contrary to the design of CSL, so the approach of the MLZ extended CSL schema is strictly circumscribed to address this particular need, without opening a door to uncontrolled general testing of field content. The solution is in two parts, described below. The CSL schema has been extended in accordance with the proposed URN:LEX standard for a uniform resource namespace for sources of law. This standard provides a concept of “jurisdiction” that suits the requirements of legal citation, including both national jurisdictions and international rule-making bodies. Following URN:LEX, the schema has been extended with an explicit list of the national jurisdictions of the world, plus selected rule-making international organizations designated by their permanent domain name. The former are drawn from ISO 3166 Alpha-2. The latter do not yet have official sanction, as URN:LEX is still at the proposal stage, but the list in the schema extension is conservative, including only a few of the most stable (and widely cited) organizations. The list of acceptable jurisdictions codes is coupled with an extension of the cs:if and cs:else-if elements, providing a jurisdiction test attribute. In styles, the value set on the attribute must be present in the list of acceptable jurisdiction values. A style that uses other values is invalid. When the jurisdiction test attribute is used, its value is compared with the value of the jurisdiction variable on the item being processed. If the values match, the test returns true, otherwise false. Matching is done at the granularity of the argument provided in the test. The test above will be true for items with a jurisdiction value of jp or de, and false for values of us, us;federal;oh or us;ny. In CSL-m, alternative cs:layout nodes can be set by giving each a separate locale attribute. See the description of cs:layout (extension) above for further details. In CSL-m, the page variable can be tested in the same way as locator. The test evaluates the label value, if any, set at the start of the field using a recognized locator abbreviation. See Locator Terms below for a list of recognised abbreviations and their corresponding CSL-m label values. The cs:label element in this example will render the localised term for the label set in the page field (e.g. “para. 3” will render in English as “¶ 3”). The CSL-m jurisdiction variable contains a juridiction specifier divided into subfields, with a colon as the subfield delimiter. The subjurisdictions test attribute takes an integer as argument. It returns true if the jurisdiction field on the item contains a value with at least the specified number of subjurisdictions. The example above will render the value of the jurisdiction field, “abbreviated” according the any mapping set for the style in the Abbreviation Filter. In the example, a value of us or us;ca will return false, while a value of us;federal;ny will return true. The unpublished localised term is available for use by CSL-m styles. In addition to the extended terms (article, rule, and title), CSL-m styles automatically set the special alternative terms Chapter and Section when rendering the corresponding terms in the context of the first item in a parallel reference. © Copyright 2016, Frank Bennett Revision 9729ddb1.